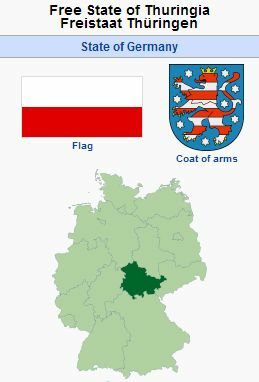 Thuringia (Thüringen), a German state (6,022 sq. mi. and a population of 2,927,497 in 1946; 16,171 sq. km (6,244 sq. mi.) and a population of 2,170,460 in 2012), located in the heart of Germany and in the heart of the area of the Lutheran Reformation, bounded on the south by Bavaria (Franconia), on the west by Hesse, and on the east and north by Saxony; capital Weimar. Other cities of importance are Erfurt, Gotha, Eisenach, Jena, Mühlhausen. The modern boundaries of Thuringia are not identical with those of the Reformation period, and the territory has suffered many changes in its rulers. In 1946 it was incorporated into the East German state as the westernmost province. Anabaptism in the heart of Germany was a consequence of the great disappointment that had taken possession of broad strata of the people in an increasing measure because of Luther's conservative reformation position and the moral unfruitfulness of his young established church, as well as his position in the Peasants' War, who had shared the mind of Thomas Müntzer both in his mystical and enthusiastic basis and in certain apocalyptic and eschatological expectations. The first center of Anabaptist propaganda (beginning in the summer of 1526) was found in the Saxon enclave of Königsberg in Franconia, where Hans Hut, and with him the cooper Volk Kolerlin, the sexton Kilian Volckaimer, the peasant Sebastian, and the cabinetmaker Eukarius Kellermann and Joachim Mertz worked for the Anabaptist cause. In their revelations a major role was played by the imminent Turkish invasion and the extermination of the ungodly that was to begin therewith. But this activity was discovered in early February 1527. Beutelhans and Wolf Schominger, citizens of Königsberg, as well as the miller of Aurach and Kaspar Spegel of Ostheim, were put to death, and a number of others escaped with only a penalty of disgrace. At the same time in electoral Saxony a decree was issued permitting only those who had been regularly called to the office of preaching to perform the functions of pastoral care. From Franconia and from Hesse about the end of 1526 Anabaptism also penetrated into western Thuringia. Its apostles were Volkmar of Hildburghausen, Michel of Uettingen, the Franconian Georg of Staffelstein, Niklas Schreiber, Hans Both, and Katharina Valebs. Apocalyptic proclamations constituted the chief theme of their preaching. But now Anabaptism progressed along more and more moderate lines. Its principal differences with the established church were now over original sin, infant baptism, and the bodily presence of Christ in the communion. The last of these points came to take on the character of a confession with the Anabaptists. Their ideal was the congregation of saints. Therefore one finds among them also to a greater or lesser degree a withdrawal from the state and its institutions, quiet acceptance of suffering as the cross of Christ, and a simple, devotional religious service by preachers chosen by the congregation. The first arrests in western Thuringia occurred in early 1528. A sexton was executed at Mehlis. Others recanted at Gotha and Georgenthal, but some rejoined the Anabaptists. Six of them were consequently beheaded at Reinhardsbrunn on 18 January 1530. But Anabaptism made most inroads in western Thuringia in the Hausbreitenbach district, to which the lenience of Philipp of Hesse, under whose jurisdiction half of the area lay, and the nearness of the Anabaptist congregation of Sorga near Hersfeld contributed. Here, besides other apostles, Melchior Rinck worked. The basic lines of his system of theology were mysticism and a thoroughly spiritualistic view of the Scriptures. Hence his opposition to all purely external religious customs from which reason is excluded. Called to answer for himself repeatedly, expelled from the country, and punished with imprisonment, Rinck nevertheless continued his Anabaptist activity within Hessian and Thuringian lands. To counter the threatening growth of Anabaptism Justus Menius wrote his book in 1530, Der Widdertauffer lere und geheimnis aus heiliger schrift widderlegt, which presents an excellent picture of Anabaptism from the point of view of its opponents. Nevertheless Anabaptism continued to progress in western Thuringia. A number of residents in Hausbreitenbach were arrested in October 1531. An official opinion by the Wittenberg theologians in general favored capital punishment, but upon the intervention of Philipp the prisoners were divided, the Saxons beheaded and the Hessians, upon recantation, released. On 11 November 1531, the authorities succeeded in taking Melchior Rinck and eleven of his audience at Vacha. Saxony wanted to have him executed, but he was now sentenced by Philipp to life imprisonment. Meanwhile Anabaptism was also making progress in the beech forests belonging to the Stift of Fulda. An Anabaptist apostle appeared here as a prophet of God and miracle worker and won a large following. About 40 of them were seized with the apostle on 25 March 1532, at Spahl in the Rockenstuhl district, after valiant self-defense, and taken to Fulda. Overcome in the prison atmosphere by religious madness, most of them remained steadfast and cheerfully submitted to beheading; only the fellow travelers recanted and were then released. But now the places of Melchior Rinck and the executed apostles of Anabaptism had been filled by others, like Georg Zaunring, Georg Stein, Jakob Schmidt, Christoph of Moravia, the sexton Alexander, [whom Wappler elsewhere calls "one of the noblest figures in the Anabaptist movement" of Middle Germany], the tailor Ilgen, Hans Both, and others. Their center was the Anabaptist congregation at Sorga. From there they developed lively agitation especially in Hausbreitenbach. In early January 1533 arrests were again made here — the peasant Fritz Erbe of Herda, and Margaretha Kochs, "die alte Garköchin." In July, eighteen more were examined at Berka. But in the end all were released, since Philipp continued to oppose the execution demanded by John of Saxony. Only Fritz Erbe and Margaretha were held, Erbe in a city tower of Eisenach, and later in the Wartburg, until his death in 1548. In Gotha the tailor Hans Riemer of Altenbergen was tried in July 1533. He escaped execution by recanting in the last hour. Meanwhile Anabaptism had found a new footing in northern Thuringia. The Anabaptist apostles working here were first Volkmar of Hildburghausen, Bernhardus, Georg of Staffelstein, and Katharina Valebs. The chief Anabaptist center here was the area of Frankenhausen. In early 1529 the first examinations were undertaken here. The arrested Anabaptists finally recanted. But in early January 1530 thirteen more were arrested, for the most part stemming from Franconia. Four, who refused to recant, were drowned, and the others expelled from the country. In the middle of 1530 seven more Anabaptists were arrested. Of these, Katharina Valebs, who remained steadfast, was executed, and Erhard Polrus, who had backslidden, was burned through the cheeks. Now the sexton Alexander began a wide-scale propaganda for Anabaptism throughout northern Thuringia and the southern Harz. With him Jakob Schmiedeknecht was working. They held their secret meetings for a time in Landgrafroda near Allstedt, Frankenhausen, and Sangerhausen. Finally, however, Alexander was seized with the others in the autumn of 1533 and executed in November at Frankenhausen. Meanwhile in the region of Mühlhausen Hans Both was continuing the propaganda begun by Alexander. The soul of the movement here was Ludwig Spon. He was arrested in May 1533 with six others and was not released until mid-November by Philipp. In September of that year the Anabaptists had been expelled from Sorga. They went to Moravia, whither, in spite of Hans Both's disappointment there, Anabaptists continued to go until the end of the 16th century. In northern Thuringia and in the Harz area Alexander's propaganda was quickly carried on by Peter Reusse of Ruse and Heinz Kraut of Esperstedt in its full scope. Especially at Emseloh and Holdenstedt they had numerous followers. They maintained connections with the Hessian Anabaptists, the followers of Melchior Rinck. In early April 1534 Georg Knoblauch of Emseloh and his wife were arrested. But he recanted and was released. His wife, however, remaining steadfast, suffered death. Following her, two other Anabaptists were executed. A place of refuge for the Anabaptists of Hesse, who called themselves "Friends of God," was the Schneider Mill at Zorge near Ellrich. From here contacts were again established with the Anabaptists of Mühlhausen, who were again working for Anabaptism, e.g., in the area of Neunheiligen. At the end of October 1534 and in January 1535 several residents of Mühlhausen and the vicinity were arrested. But by the middle of 1535 all were released, in spite of the fact that Saxony insisted on capital punishment. They now found a refuge in the Lutter Forest near Lauterberg in the Harz and at Halberstadt, where, following the example of the first Christian church, they led a holy life full of brotherly love in all simplicity. In addition to Peter Reusse and Heinz Kraut, Georg Köhler now began to work for the Anabaptist cause. In Riestedt and in the vicinity of Mühlhausen, where Barbara Meissrod's home became a new center for them, they were very successful. In early April 1535 arrests were made in Riestedt. A new hiding place for the followers of Anabaptists was now Schraubenstein between Riestedt and Emseloh. From here they frequently visited their brethren at Halberstadt. On 2 September 1535, two of them, including Georg Köhler, were seized, and soon after beheaded at Sangerhausen with another Anabaptist woman. The same fate soon struck three of the Anabaptists of Halberstadt, who were drowned in the Bode at Groningen. On 20 November 1535, Heinz Kraut with a number of Anabaptists, including Georg Knoblauch, were at the home of Hans Peissker of Kleineuterdorf near Orlamünde, a miller. On the next morning all were arrested, a total of 16 persons, and taken to the Leuchtenburg. The women were detained here, while four of the men, among them Heinz Kraut and Hans Peissker, were taken to Jena, and four others, including Knoblauch, were taken to Neustadt on the Orla, and three to Kahla, The prisoners at Jena, whose trial was conducted by Melanchthon, were with one exception unreceptive to teaching. They were consequently beheaded on 26 January 1536. Of the other prisoners, at first only Peissker's daughter Margaretha recanted. But after many attempts, in which Melanchthon again participated, both on the Leuchtenburg and at Kahla, all but one were persuaded to recant. The steadfast one was beheaded. A consequence of this Anabaptist trial was that Melanchthon wrote the second Saxon Anabaptist mandate on 10 April 1536, and also the Verlegung etlicher unchristlicher Artikel, welche die Wiedertäufer furgeben. Nevertheless there were further arrests of Anabaptists in eastern Thuringia in 1539 and 1540; the prisoners recanted and were released. For the Anabaptists of northern Thuringia and at the Harz Mühlhausen was a center from 1535 on. In the place of Heinz Kraut and Georg Köhler, a certain Matthes was the leader. At the beginning of October 1537 the Mühlhausen city council took steps against these conventicles. Ten of the arrested men and women were drowned in the Unstrut and four expelled from the city. Of the remaining four prisoners, two were drowned on 17 January 1538. About the same time an Anabaptist execution took place at Brücken on the Helme. But still Anabaptism did not disappear from northern Thuringia. In 1544-45 there were again Anabaptist trials at Mühlhausen, but now Philipp vigorously opposed their execution. In western Thuringia sympathy for Anabaptism was long preserved, especially by the long imprisonment of Fritz Erbe. Two men, who were found in conversation with him in November 1537, were beheaded as blasphemers at the end of January 1538. The excitement caused by this execution was the occasion for the writing of Justus Menius's booklet in 1538, Wie ein iglicher Christ gegen allerley lere, gut und böse, nach Gottes befelh sich gebürlich halten soll, a book which denoted a lapse toward Catholic concepts. During Lent of 1539 three Anabaptists were again discovered in the tower with Fritz Erbe. They escaped death by recanting. The same thing recurred in early 1540 in the case of three Anabaptists at Kreuzburg. Meanwhile Anabaptism was gaining the upper hand in Fritz Erbe's home community. On 7 and 8 February 1544, a large Anabaptist cross-examination was held at Berka, but again it took its course without result because of the lenience of Philipp. In the parish of Gotha the peasant Klaus Ludwig of Tüngeda caused some trouble. Repeatedly examined by Myconius, he always managed to avoid execution by recanting. After the middle of the 16th century the decline of Anabaptism in Thuringia became increasingly evident. Bender, Harold S. and Paul Wappler. "Thuringia (Germany)." Global Anabaptist Mennonite Encyclopedia Online. 1959. Web. 21 Apr 2019. http://gameo.org/index.php?title=Thuringia_(Germany)&oldid=132384. Bender, Harold S. and Paul Wappler. (1959). Thuringia (Germany). Global Anabaptist Mennonite Encyclopedia Online. Retrieved 21 April 2019, from http://gameo.org/index.php?title=Thuringia_(Germany)&oldid=132384. Adapted by permission of Herald Press, Harrisonburg, Virginia, from Mennonite Encyclopedia, Vol. 4, pp. 717-720. All rights reserved. This page was last modified on 20 July 2015, at 19:04.